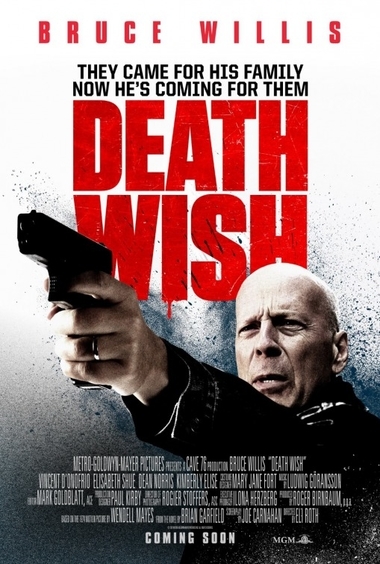 The good news is that Death Wish, the 2018 remake of the iconic 1974 Charles Bronson-starring original, puts Bruce Willis back where a star of his stature should be: on the big screen. After spending much of this decade in direct-to-video schlock, it’s a kick to see Willis in such fine form in a first-run, A-list, wide theatrical release. He stars as Dr. Paul Kersey, a Chicago-based surgeon whose life changes when a home invasion results in the critical injury of both his wife (Elisabeth Shue) and daughter (Camila Morrone). The bad news is that while director Eli Roth knows how craft a suspenseful action sequence, he’s less adept at handling the social issues inherent in a story that advocates vigilantism. 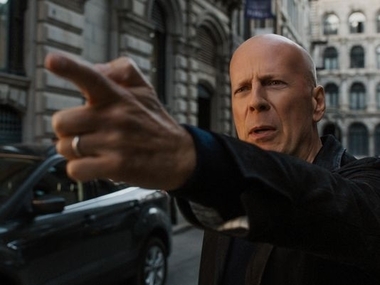 One only need glance at recent headlines (school shootings, the 2017 Las Vegas shooting, controversial officer-involved shootings, ever-heated gun control debates) to see that the new Death Wish is a potential hot potato. Dr. Kersey decides to seek vengeance for the attack on his family after the police investigation, headed up by well-meaning Detective Rains (Dean Norris, not required to stretch much from his role in Breaking Bad, turns up few leads. Roth and screenwriter Joe Carnahan (The Grey) play up the recent crime spike in Chicago with the zeal of the most conservative pro-gun advocates. This could’ve been treated in a more thought-provoking way, but Roth has opted to exploit audience’s basest instincts by making it near-impossible to even think about rooting against Dr. Kersey. Who wouldn’t at least fantasize about hunting down the vermin who broke in and caused such violence to their family (unlike in the Micheal Winner-directed original, Kersey’s daughter is not raped—this is the only area in which Roth tones down the violence of the original), subsequently acting as judge, jury, and executioner? Some of Kersey’s more visceral “kills” were met with hoots and applause at the screening I attended. In the film, any attempt at thoughtful discourse is represented by a pair of opposing real-life talk radio hosts. Playing himself, Sway Calloway calls out the “Grim Reaper” (the news media’s nickname for the hooded Dr. Kersey) as an irresponsible criminal going after other criminals. He also brings the issue of race into focus (most of the Caucasian Kersey’s targets are minorities). Also popping up throughout the film as himself is “Mancow” Muller, vigorously adopting the stance of pro-vigilantism and heralding the “Grim Reaper” as just what Chicago’s mean streets need. Death Wish is best approached as a reasonably taut (perhaps too taut at times—Kersey’s brother Frank, played with odd ambivalence by Vincent D’Onofrio, desperately needs a clearer character arc) star vehicle for Bruce Willis. Impressively trim at 62, Willis sells Kersey’s seething anger in subtle ways, never resorting to histrionics. The film is at its most entertaining as we watch the mild-mannered Dr. Kersey—previously accustomed only to healing people rather than harming them—immerse himself in a world of weaponry. But in the end, one can’t help but feel that this story of doctor-turned-executioner should’ve been much more.